Huge Savings Item! 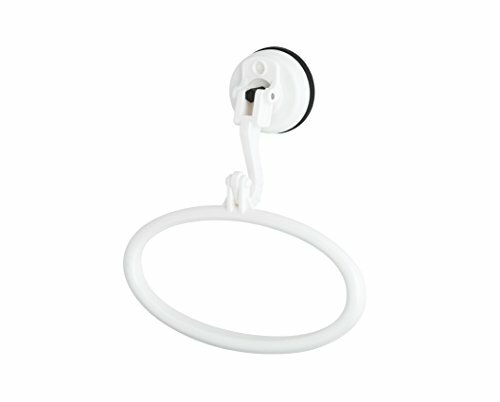 Save 16% on the FECA FE-B5004 No Drill Powerful Suction Cup Towel Ring Holder for Bathroom & Kitchen Finished Marble & Tile, White by FECA at Wakaf Center. MPN: FE-B5004. Hurry! Limited time offer. Offer valid only while supplies last. This suction cup towel ring softens any kitchen, bed and bath décor with clean lines and smooth edges. Perfect for hanging shower and hand towels. This suction cup towel ring softens any kitchen, bed and bath décor with clean lines and smooth edges. Perfect for hanging shower and hand towels. Provides essential towel-holding functionality while lending an elegant touch to the home. Add to any nonporous surface by simply lifting, pushing and locking in place. Holds up to 4 pounds. Suitable for nonporous surfaces only such as glass, mirror, polish stainless steel/metal, plastic board, finish marble, polished tiles, etc. For tight vacuum seal. Non-suitable surface material: porous surfaces such as dry wall, concrete, wallpaper, wood, imitation brick tile, painted wood surface without high gloss coating, etc. IMPORTANT: Suction cup will only mount on non-porous, smooth surfaces such as glass, mirror, polish stainless steel/metal, plastic board, finish marble, polished tiles, etc for tight vacuum seal.